First published in 1855 as part of Leaves of Grass, “Song of Myself” was revised by Whitman in subsequent editions in ways that sometimes undermined its original freshness and vitality. Stephen Mitchell has gone back to the first edition and painstakingly compared it with the later versions, substituting only those revisions by Whitman that in his opinion improved the poem. “Song of Myself” is by far the greatest poem ever written by an American. At each rereading I feel exhilarated, as if for the first time, by its freshness and breadth of vision, its bodiliness, its high spirits, its astonishing empathy, by the freedom and goofiness and dignity of its language, and, not least, by its spiritual insight. It is a miracle of a poem. But a pocket edition? To shrink this expansive, world-swallowing language even to the size of a normal book is a bit absurd. (The first edition measures eight inches by eleven, and its lines seem to go on for miles.) Still, I think Whitman would have been touched at the prospect of being carried around in the breast or hip pockets of young men and women, intimately, close to the flesh. A few words about the text presented here. 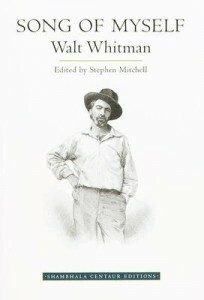 Whitman’s vision and his language were at their most powerful in the first edition of Leaves of Grass, published in 1855. As he grew older, his insight faded, and with it the vivacity of his words. Yet in each successive edition he kept tinkering with “Song of Myself” and the other early poems — adding, deleting, revising. And while certain of these revisions are excellent, most are disastrous. This has led to affectionate frustration among some of Whitman’s readers; we want the best of all possible editions. through my belly and breast. And he entirely deleted the weird and thrilling ninth line. I hear the chorus . . . . it is a grand-opera . . . . this indeed is music! In this conflated version of “Song of Myself,” I have used the first edition as my main source, and I have adopted any revision that seemed like even a minor improvement. The section numbers, which first appeared in 1867, may be useful in providing a more readily apparent structure, but they are often arbitrary, and they impede the uninterrupted flow of one stanza into the next, over the whole expanse of the poem. Egotism and selflessness: one contradiction among many. But the poem is large . . . . it contains and embraces multitudes.